"Formal Theories of Time and Temproal Incidence", Lluis Vila. "Time Granularity", Jerome Euzenat and Angelo Montanari. "Modal Varieties of Temporal Logic", Howard Barringer and Dov Gabbay. "Temporal Qualification in Artificial Intelligence", Han Reichgelt and Lluis Vila. "Computational Complexity of Temporal Constraint Problems", Thomas Drakengren and Peter Jonsson. "Indefinite Constraint Databases with Temporal Information: Representational Power and Computational Complexity", Manolis Koubarakis. "Processing Qualitative Temporal Constraints", Alfonso Gerevini. "Theorem-Proving for Discrete Temporal Logic", Mark Reynolds/Clare Dixon. "Probabilistic Temporal Reasoning", Steve Hanks/David Madigan. "Temporal Reasoning with iff-Abduction", Marc Denecker/Kristof Van Belleghem. "Temporal Description Logics", Alessandro Artale/Enrico Franconi. "Logic Programming and Reasoning about Actions", Chitta Baral/Michael Gelfond. "Temporal Databases" Jan Chomicki/David Toman. "Temporal Reasoning in Agent-Based Systems" Michael Fisher/Michael Wooldridge. "Time in Planning" Maris Fox/Derek Long. "Time in Automated Legal Reasoning" Lluis Vila/Hajime Yoshino. "Temporal Reasoning in Natural Language" Alice ter Meulen. "Temporal Reasoning in Medicine" Elpida Keravnou/Yuval Shahar. "Time in Qualitative Simulation" Dan Clancy/Benjamin Kuipers. This collection represents the primary reference work for researchers and students in the area of Temporal Reasoning in Artificial Intelligence. Temporal reasoning has a vital role to play in many areas, particularly Artificial Intelligence. Yet, until now, there has been no single volume collecting together the breadth of work in this area. 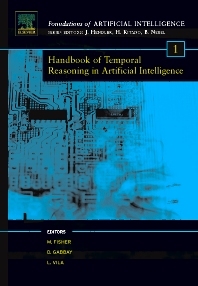 This collection brings together the leading researchers in a range of relevant areas and provides an coherent description of the breadth of activity concerning temporal reasoning in the filed of Artificial Intelligence. Researchers, Students and Computing professionals. Universitat Politecnica de Catalunya, Barcelona, Spain.